If there is a niche on mobile devices that is flooded with apps it is the weather niche. There are so many weather apps available that it would take weeks to test them all. And if you are thinking of launching a weather app to one of the stores, you better make sure that it offers something that other apps don't offer. The forecast.io service on the Web does that for instance, and Microsoft's Climatology app for Android aims in that direction as well. Microsoft has released the application only for Android and not for the company's own Windows Phone operating system. It is unclear why the company has gone down that route but the most likely explanation is that it is using the app to test the waters. Anyway, when you launch Climatology after installation you will notice that it does not provide you with weather information, or at least not weather information of the current day or a forecast. Instead, it lets you pick a location in the world, say Germany, and a month, and displays climate information for that location to you. 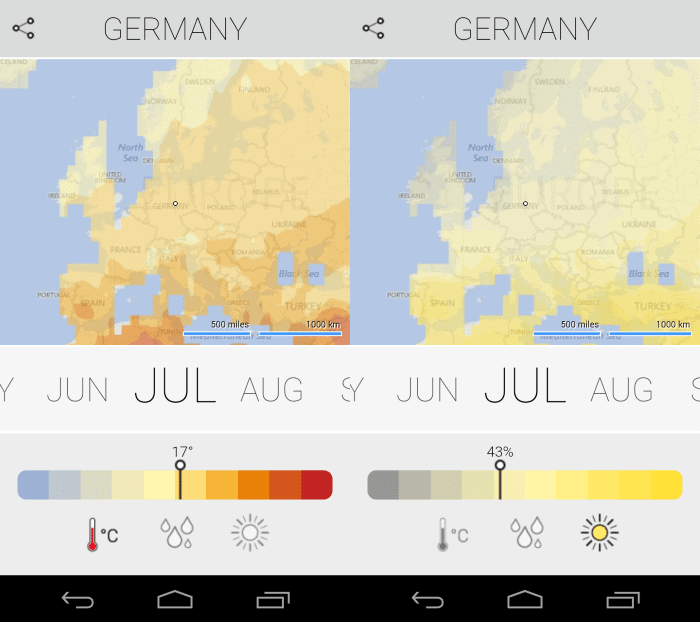 So, the average temperature in Germany in July is 17 degrees Celsius, there are 15 days of rain on average, and 43% is the average amount of sunshine each day. Note that the values may change depending on the location you select in the country. If you pick Miami in the US, you will get different average values than in Augusta, Main for example. The only other feature that the app offers at the time of writing is a map view of the information. If you select the temperature for instance, the map is highlighted in colors to visualize the temperature in other regions and countries. Those give you rough information which can be useful as you don't have to drag the map over to other countries to get a rough reading. Climatology makes available average climate information of regions and countries in the world. While that may be useful to some, students for instance who research these kind of things or families planning their next vacation, it is fairly limited in regards to the information offered. It would be interesting for example to compare the average with the current values and forecast. That's however not supported unfortunately right now. Still, if you find the concept interesting, why not give it a try? Nexus 5, running 4.4.4 Kitkat, app is not supported on it.